Taipei Times reports eight injured in green stampede for GBP7.50 shopping bags! Environmentalists gathered at the entrance of the Breeze Center in Taipei, criticizing the shopping mall over its handling of the sale of Anya Hindmarch's eco-friendly bags last Friday. Ho Tsung-hsun, secretary general of the Taiwan Environmental Protection Union and organizer of the protest, said the fashion company should also be held responsible for the chaos last week. "Given that hundreds of customers have already lined up in front of the store the night before the sale, the company should have marked a clear route for the line to move smoothly and peacefully," he said. "Their marketing strategy is definitely eco-unfriendly." Ho also said that the company could have done better than simply tell the public that "It's Not a Plastic Bag" -- the slogan printed on the front of the Anya Hindmarch bags. For Sandra Peng, representative of the Taiwan Environmental Action Network, the stampede outside the Anya Hindmarch stores last Friday was hard to forget. "I was speechless when I saw people fighting for the eco-friendly shopping bags on TV," she told the Taipei Times. "I was thinking -- `Well, if only the same number of enthusiasts were committed to protecting the environment.'" While Peng agreed that the public should be informed about the urgent need for environmental protection, she noted the fundamental conflict that exists between encouraging consumption and preserving the environment. "I really doubt that anyone bought the bag for the sake of protecting the Earth," she said, adding that she was aware that some bought the bags in hopes of selling them later at a higher price. Lim said his shopping bags were made from various materials -- from used plastic bottles to other biodegradable substance. 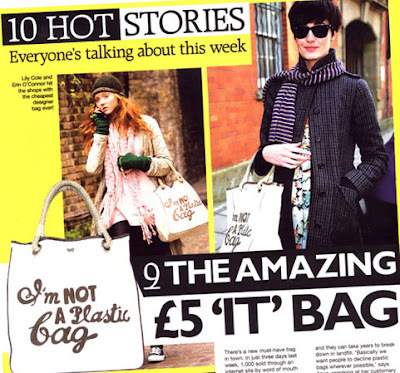 Controversies have dogged the bag since it was first released in Britain. A BBC News broadcast on March 14 showed "We Are What We Do," an activist group that coordinated with the company in the campaign to encourage the reuse of shopping bags, was upset to find the product selling for? 175 (US$351) on eBay. The bag originally retailed at? 5.